“Pirogue”: defined as a large canoe employing a sail, French, from Spanish piragua, a Caribbean dugout canoe hollowed from logs. Many Pirogues were built in Wheeling in the 1700s and early 1800s. “Meriwether Lewis had ordered a pirogue built and delivered to him by July of 1803 in Wheeling, Virginia.” In early September of 1803, Lewis and his group arrived at Wheeling in a Keelboat and Canoe, and took possession of the Red pirogue and purchased a second newly completed white-washed pirogue. 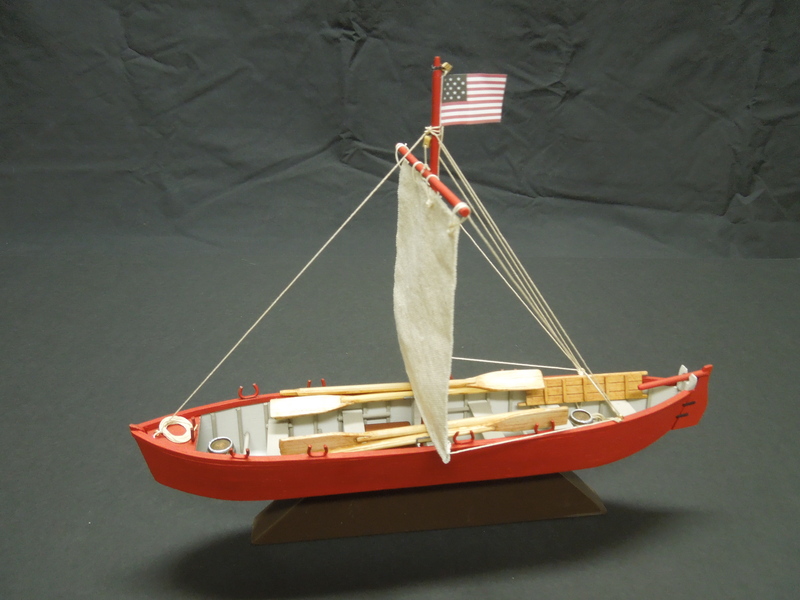 This is an exact replica model of the Red Pirogue built at Wheeling, Virginia in 1803 for Meriwether Lewis per his drawings and specifications. It had a pointed bow and stern and was flat-bottomed. It was 36 ½ feet in length, 7 feet in width and was painted with Red Lead thus the red colour. Lewis stipulated that it be provided with eight “tholes” (two upright pins set in the gunwale) used for positioning the oars and a tiller. Legendary local West Virginian, Sgt. Patrick Gass was a member of the Corps of Discovery, the Corps’ carpenter. During the journey, the Corps having lost one of their boats had Patrick build another of this same type. Patrick Gass was the Great-Great Uncle of John Bowman, builder of this model. In 1807, Patrick Gass published the first journal of the expedition.